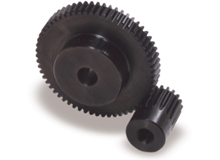 The SS Spur Gears are made from carbon steel and are NOT hardened. These Spur Gears are economically priced, general usage gears, with a large selection of modules and numbers of teeth. These Spur Gears are easily customizable and J Series configurations of these Spur Gears are also available.